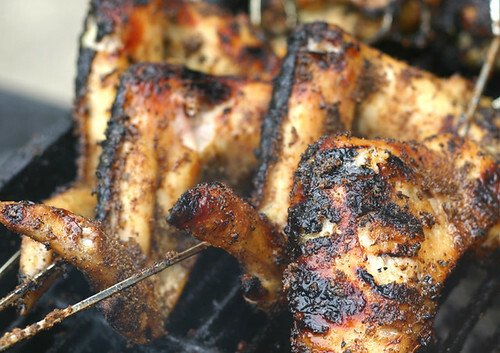 What’s not to love about grilled wings! These are super HOT and DELICIOUS! Remember back in the day when the hottest thing I could take on a taco was ketchup? I’ve come a LONG way BABY! You can grill or bake these. Be sure to plan ahead – they need to marinate over night. I also recommend that you try a few without the final round of sauce or just brush it on lightly instead of dousing. We like ours with a mix of both – sometimes your mouth just needs a little break. Place 4-5 Lbs of Wings in gallon size Zip Loc storage bag. Seal. Let marinate eight hours or over night if possible. Rotate bag periodically to distribute marinade. Drain wings and sprinkle generously with this seasoning – Cover entire wing! 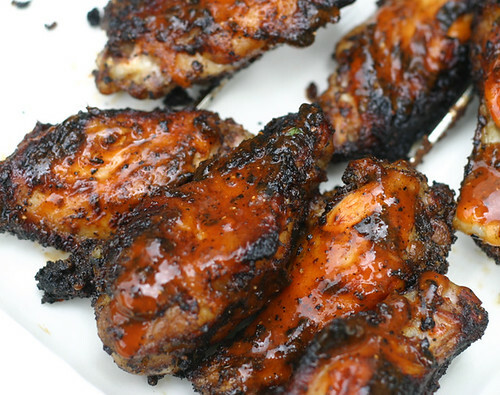 Bake or grill wings. To Grill – Preheat grill to 400°. Oil grill grate and grill for 10-15 minutes on both sides until wings are 165°. To bake: Spray baking sheet with cooking spray. Bake wings at 375 degrees for 15- 20 minutes then turn them over and bake another 15- 20 minutes until 165° degrees. I like to enjoy a few wings at this stage prior to them going into the FIREY sauce below. I have also just basted some of the sauce on instead of dunking them. Toss in wings and cover evenly. An observation – “marinade” is a sauce in which you “marinate” food. These look good. Patty (aka Mom) has tried relentlessly to get me to correct the error of my ways with those two words!